If you read my last post you might have anticipated my next post would be for creamy mushroom soup. Hope you aren't too disappointed to see berries instead. The soup recipe came from a highly credible source, Cook's Illustrated. The soup turned out okay, but I didn't love it. I haven't given up on it though. I have some ideas of what may have held this soup back from being great so I'll give another go at some point. In the meantime, what I know is great, are fresh, ripe, sweet strawberries straight from the fields to the farmer's market. Living in southern California gives me pretty good access to local berries early in the season. The funny thing is I didn't have my first berries of the year at home. Two weeks ago Hubby and I took a trip to the mid-west and I was pleasantly surprised when some phenomenal strawberries appeared on my yogurt and granola breakfast in a suburb of Detroit, Michigan. I thought perhaps it was a fluke. Then last week I was in New Jersey for work and I had more amazing strawberries. Really, really amazing. I've had strawberries on the brain ever since. I knew a trip to my local farmer's market was number one top priority business this past weekend. I wasn't disappointed. The market was teeming with berries, some big, some small, some gi-normous. I sampled the small berries and they had the most unbelievably sweet flavor. Sold! I'll take 3 baskets, please! Hubby doesn't eat strawberries so that's 3 baskets of berry heaven all for me. I decided the first order of business was a simple, but delicious, application of my new found treasures. 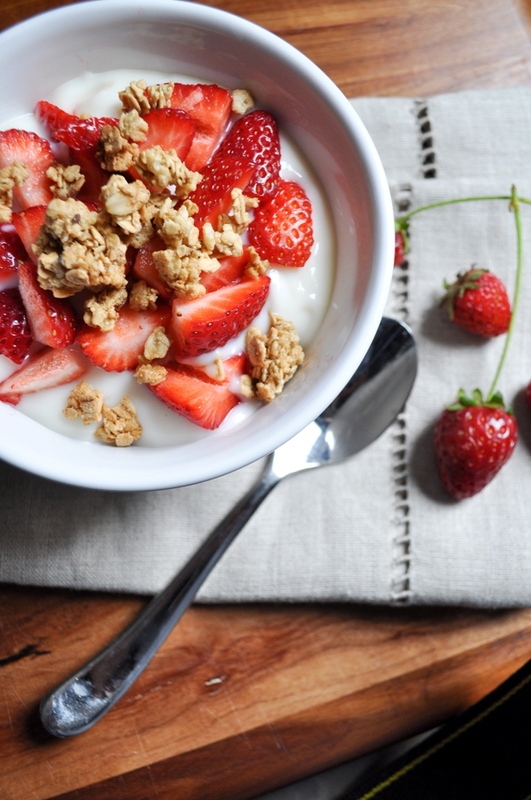 Vanilla yogurt topped with fresh cut berries and crunchy honey kissed granola. I plan to rinse and repeat at least a few more days this week. A great way to start the day! I always struggle with storing strawberries. I feel like they start growing mold the day after I bring them home. So I asked the girl behind the table at the farmer's market how she recommends storing them. She suggested placing a papertowel in the bottom of a tupperware and placing a single layer of berries down. Cover with another paper towel and a layer of berries, and repeat. Store the tupperware in the fridge. I'm only on day two, but I think it's going to work. I hope to be posting more strawberry focused posts this week so I'll let you know how this method holds up. 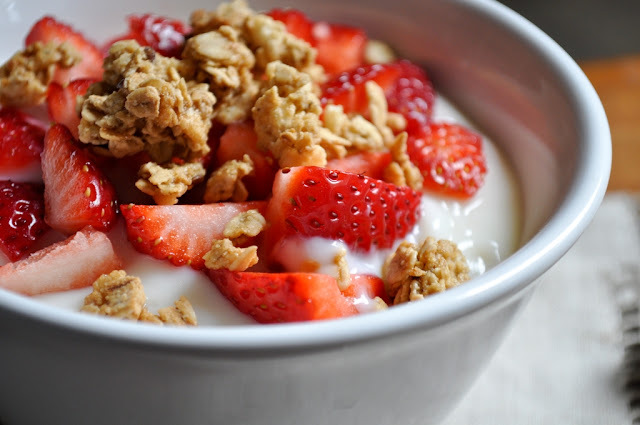 Place 1/2 of the yogurt in a small bowl and top with 1/2 of the granola. 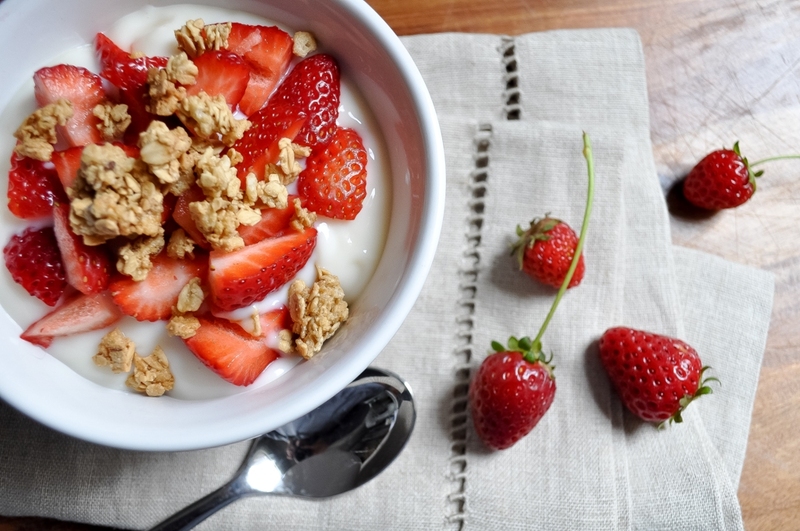 Spoon the remaining yogurt on top and finish with berries and remaining granola. What a perfect breakfast. We are still getting berries from Mexico. California berries should be here any day, can't wait. The berries from California bloggers always look SO much better than anything I can ever find around here. They're just gorgeous! Great pics Gloria, and this is a wonderful way to start the day. I have a good load of strawberries from my Aunt...This can be a great way to serve it. Thanks for this post! This is one of my favorite breakfasts when strawberries are in season too. Beautiful pictures!